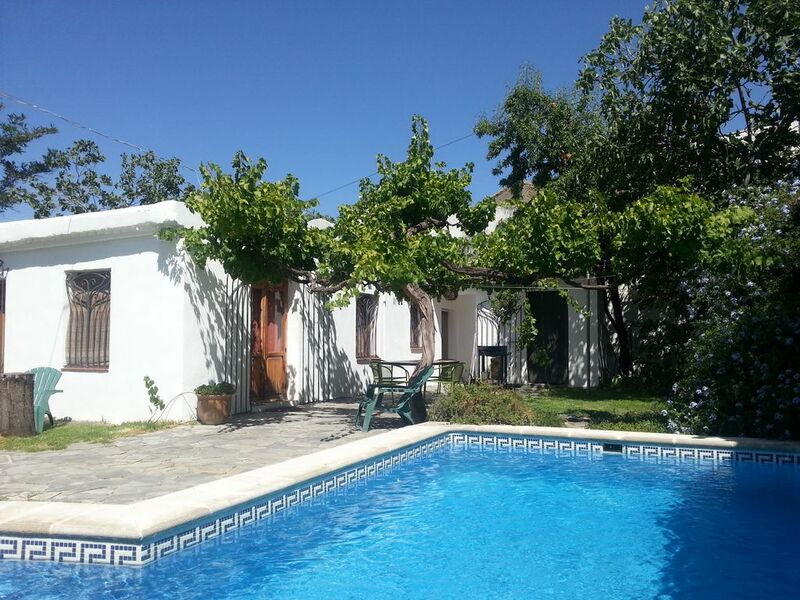 Los Almendros is a lovely cottage with a large garden and private pool (4m x 8m). Located just on the edge of Niguelas, a charming village in the beautiful Lecrin Valley. The accommodation is made up one double bedroom and one twin. The dining/ living room is open plan and runs the length of the property. There is direct access from the living area to the garden through French doors. The living area is equipped with TV, DVD and a stereo. The kitchen is very well equipped and the bathroom has recently been renovated. The mature garden is made up of areas of lawn and terrace surrounding the 4m x 8m swimming pool. Grape vines and almond and fruit trees provide shade. There is a barbecue and outside seating for dining al fresco. Air conditioning which makes Los Almendros comfortable in the heat of the summer. Along with a woodburning stove and electric radiators, the air-con also provides heating in the cooler winter months. Situated between Granada and the Costa Tropical and with excellent road links, everything the area has to offer can easily be reached by car. The beaches of Costa Tropical (30 minutes), Granada with the Alhambra Palace (30 minutes) and Sierra Nevada ski resort (55 minutes). Wifi internet connection. I have lived full time in Nigüelas since 1994, but have been coming here for holidays since 1982. We sold our first little holiday home and bought Los Almendros in 1996. The house was originally the village post office. There were outbuildings for animals and even an outside kitchen and lavatory! After a complete renovation, we lived in the house for a couple of years. Around this time I started working as an artist blacksmith. I set up my first forge where the pool is today- the garden gates were made there! After outgrowing the workshop we knocked down the remaining outbuildings and put in the swimming pool. We have been letting out Los Almendros as a holiday rental ever since. My wife Hermy is a professional musician and sings in rock and pop bands all over the country. She is also a vocal coach in two music schools. We have a 15-year-old son, Isaac. And a bodeguero andaluz dog called Pinky! Large modern bathroom with separate shower and bath. The living area has two sofas, TV, DVD player, stereo. Wifi router. Basic items such as salt, pepper, oil and vinegar. Open kitchen dining and living room. Large mature garden with terraced and lawned areas. Shade provided by fig trees and grape vines. The resort of Sierra Nevada is about 55 minutes away on an excellent road. Well organised and extensive it provides something for all skiers alike. The season begins in early December and lasts until May. So at certain times of year it's possible to ski in the morning and sunbathe on the beach in the afternoon! The Santa Clara golf course is the nearest at 15 minutes away, and has the breathtaking Sierra Nevada as a backdrop. There is a beach side course at Motril (Los Moriscos), about 30 minutes away. Notes on accommodation: There air conditioning in the kitchen/living room and bedrooms which makes it very comfortable in the heat of the summer and radiators and a woodburning stove for the cooler winter months. Outside: Lovely mature garden with lawned and patio areas. Shade is provided by grape vines and fig and almond trees. Good sized private swimming pool (8m x 4m) with loungers and adirondack chairs. Barbecue and table and chairs for al fresco dining, Utility Room: Iron, ironing board Towels / Linen / Linen and towels are provided. All the beds have duvets for the winter months. TRES BON SEJOUR! ENDROIT AGREABLE ET TRES CALME. NOUS REVIENDRONS! For us, the house ticked all the boxes, good size, well equipped and very comfortable. The garden and pool were fantastic, a lovely and private area with plenty of space. The location is great, close to Granada and the Sierra Nevada, and surrounded by beautiful countryside, towns and villages - a lot to do and see. Would fully recommend staying here, and hope to return again soon. Thanks for the fantastic review!. We hope to see you again soon! A real home from home in the foot hills of the Sierra Nevada mountains. Best equipped house we have stayed in - every little detail thought of which made things special. Very clean and comfortable. A warm welcome from Adam, also offering snippets of information and places to see in the area. Ideally situated for exploring the Granada region - one day in a ski resort making snowmen in -2c, the next day on the beach in 24c. What a fantastic review, thank you Darren and Dave! We're really pleased you enjoyed your stay in Nigüelas. Hasta la proxima!! We had a truly lovely time during our stay at Los Almendros. The cottage was charming. We loved the traditional Spanish elements such as the curtains, screens, wooden shutters all set of beautifully by Adam's iron wrought work. The garden was our a little oasis and we all enjoyed the lovely pool. The cottage was clean and well presented and provided everything we needed for our stay. If there is one thing to improve the cottage it would be putting air con in the bedrooms as the nights were pretty warm even with fans and windows open! Niguelas is a lovely traditional Andalusian village which was exactly what we wanted. There is a lovely church and square with local shops a few bars and restaurants, all low key. We would especially recommend 'La Tasca'. Plus a big Mercadona supermarket a 5min drive away. The local people were very friendly and we all felt welcome and safe during our stay. Niguelas was well placed to visit places of interest. In about 5 mins you are on a very good motorway taking you to Granada in 25mins and in about 30mins in the opposite direction to the coast. We visited the Las Alpujarras region, Granada and the Alhambra, A beautiful village in the mountains called Montefrio (note church, & fortress only open 11 til 2pm!) as well as the coast. There is lots of info in the cottage to help you decide where to visit, there really is so much to see but some days it is hard to drag yourself away from the pool! Thank you Adam and Hermy for a lovely holiday, we appreciated that you were there to help if needed but were never intrusive. We would definitely book your cottage again in the future. Thank you very much for such a great write up! We’re very glad that you enjoyed the house and the area. We’ll definitely consider air-con for the bedrooms. Nigüelas is quite high (940m) it normally freshens up at night, but we’re having an exceptionally hot summer this year……! Situated in the magnificent Sierra Nevada Mountains and nestled at the top of the unspoilt and tranquil village of Nigüelas in the Lecrin Valley, this traditional cottage was just perfect. Set in a lovely garden of grape vines, almond and fig trees with a small but ideal pool, you really do feel like you have your own little piece of heaven. Owners Adam and Hermy were very attentive pre arrival and once arrived, just enough and not too much – exactly as you would wish. The village is so accessible, a mere 1 hr 40 drive from Malaga airport and only 20 minutes away from Granada. We particularly enjoyed our days at La Herradura (horseshoe beach on the coast), Pampaneira, Bubión and Capileira. The villages all cling to the steep slope sides and are packed with lovely handicraft shops situated amongst lovely whitewashed stone buildings - the views are really quite stunning. There is so much to do in this region - walking, cycling, horse-riding, days at the beach, lazy days at the pool, village trips, Alhambra… whatever takes your fancy but please do get out as a fantastic region. Perfect week and just wished we had booked longer. La casa está muy bien, se llega fácil, y es bonita y acogedora. Perfecta para la época de primavera y verano. No me gusta que cobren las comisiones de PayPal por el pago ni el precio de la luz, que pienso debería estar incluido en el precio. Los dueños fueron amables y atentos. Un saludo! Hola María, Muchísimas gracias por tomarte tu tiempo en comentar vuestra estancia en la casa. La comisión de Paypal para negocio es como las comisiones bancarias, no podemos hacer mucho. El tema de la luz lo explicamos antes de la reserva para que el cliente decida, cobramos algo simbólico ( salió 2 euros en vuestro caso) intentando animar un consumo responsable. Por supuesto, tomamos nota de vuestras sugerencias para un futuro. Y de verdad esperamos que hayáis disfrutado vuestra estancia. Niguelas is a traditional village with shops, bars and two restaurants. Set just below the Sierra Nevada mountains and on the edge of the Lecrin Valley make it ideal for walkers. The pan-European GR7 walking route runs close by. Nigúelas has a strong musical tradition and there are events throughout the year. Niguelas is the highest village in the lovely Lecrin Valley. The rest of the valley is made up mainly of pretty white villages surrounded by olive, almond and citrus groves. A beautiful area - perfect for a drive, a walk or a spot of lunch! Airports. Granada airport - Easyjet have recently started flights from Gatwick and Manchester. The airport is small and car hire options might be more limited, but it's only 30 minutes away. Malaga Airport is 1.5 hours away by car, and Almeria is 2 hours drive. Although there is a good bus service to Niguelas and nearby Durcal, car hire is strongly recommended to allow you to explore all the area has to offer. Granada and the Alhambra, 25 minutes. Granada is a beautiful city with a rich cultural heritage from its Moorish past. A vibrant city with many squares and narrow lanes with shops, tapas bars and restaurants. No visit to Granada is complete without seeing the Alhambra Palace and the Generalife gardens. The monument is extremely popular at any time of year so we recommend you book well in advance. The Alpujarra - a unique mountainous region south of Granada. The Moors persisted here longer than anywhere else in Spain. This is reflected in the small white villages made up of flat-roofed houses. Villages in the high Alpujarra (Pampaneira, Capileira, etc) are particularly worth a visit. Trevelez, one of the highest villages in Spain is famous for its ham. La Laguna de Padul - La Ruta del Mamut (the mammoth route) is a series of walks in and around the wetlands. There are wooden walkways and hides for observing the waterfowl. The area is ideal for walkers and naturalists as there is a great variety of wildlife - higher in the Sierra Nevada wild boar and Spanish Ibex can be seen. Booking Notes: Cost of logs and electricity is extra Booking deposit 50% Please note that payment by PayPal is subject to their transaction fees. Balance to be paid on arrival. Los Almendros has been officially registered as a holiday rental house with the government of Andalucia. Vivienda Turistica Alojamiento Rural Nº VTAR/GR/00335 For more details please get in touch. Changeover Day: Our changeover day is Sunday but we can be flexible in out of high season.